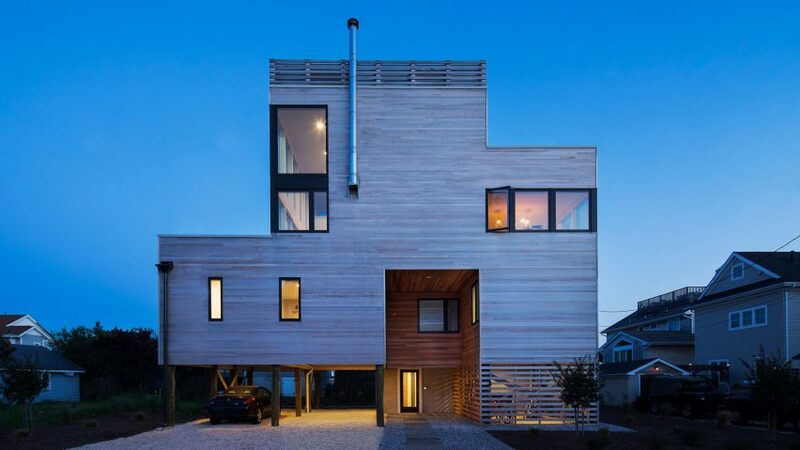 This beachfront house designed by Jeff Jordan Architects for a Manhattan-based couple comprises boxy, cedar-clad volumes that create expansive outdoor spaces overlooking the New Jersey coastline. 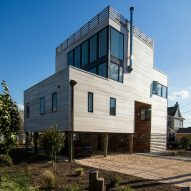 Located within walking distance from the beach, the entire structure of Sea Bright House is lifted on stilts and incorporates storage areas beneath. 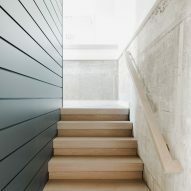 From the street, a stone walkway leads to the entrance staircase. The first storey encompasses private programmes. 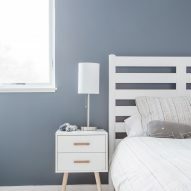 The home's three bedrooms are laid out along a central corridor, with bathrooms and a laundry room. At the end of the hall, a large master bedroom enjoys its own ensuite. 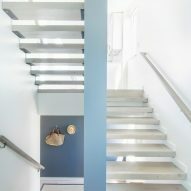 The second storey is reserved for social spaces. The large, double-height area contains the kitchen, living and dining room in an open-plan configuration. 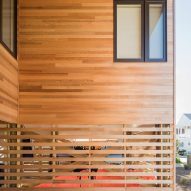 "The most important space in the house is the second floor living area that extends out to form the sun deck and up to define the mezzanine level," said Jeff Jordan Architects, which has also overhauled a 19th-century row house in Jersey City. 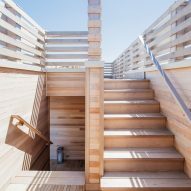 Including a mezzanine level was a way for the studio to maximise ocean views. 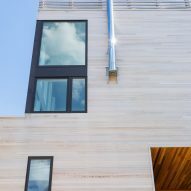 "Because the city's zoning code limits all residential construction to two stories, the goal of the design was to create the best possible views of the ocean while respecting the constraints imposed by the local government," they said. 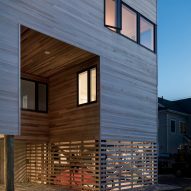 A two-storey glass wall brings ample light into this space. 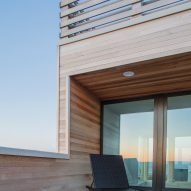 While the ocean is visible from the living room, climbing up to the mezzanine provides better vistas. 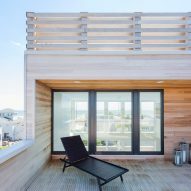 An additional rooftop deck provides a secondary outdoor space for residents and their guests. 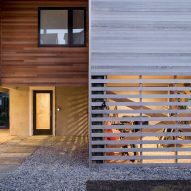 "Because this house would be used primarily during the warmer periods of the year, it was necessary to create comfortable and functional outdoor spaces," the architects said. 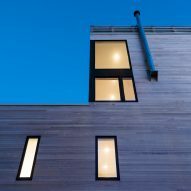 Although the home's boxy massing stands out against its traditional neighbours, the architects chose a cladding material that references typical beach house architecture. 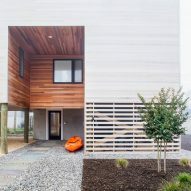 The horizontal cedar boards are reminiscent of several examples of beach modernism, from the mid-century homes by Harry Bates and Horace Gifford in Fire Island Pines, to recent constructions such as Leroy Street Studio's Bay House in the Hamptons. Photography is by Gregory Maka.